Running a web server behind a router (NAT) has always been a difficult task. Almost nobody can successfully smooth it out without any required knowledge or experience as well as manual configuration on routers. Usually, you need to configure your router manually for port mapping/forwarding. Now things have changed. 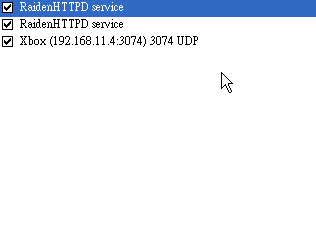 In the latest version of RaidenHTTPD v1.1.49+ with UPnP NAT traversal built in, all the above troubles are gone. The RaidenHTTPD UPnP NAT traversal can automatically setup your router to fulfill this task. If you have already enabled UPNP on your router, this operation should succeed. Go to control pannel -> network connections -> Internet Gateway Devices and check for the port mappings. If you see the port mappings are depicted with RaidenHTTPD comments, then the setting is correct. Ask a friend to connect to your web server's WAN IP from outside of the router and try both port 80 and 443(if you are using SSL) to see if it works.